If you are a cycling enthusiast, or love to compete in triathlons, then you’re in luck. The Sacramento area is one of the best locations for riding a bike, whether on the trails or on the road. Auburn, Rocklin, Roseville, and Folsom...all of these areas and more are home to some of the best cycling around. But what if you’re dying to get in some cycle training for your next race and the weather just won’t cooperate? Triathlon indoor bike training is just the solution to your winter weather woes. Besides the obvious benefit of getting to continue your training when it’s cold and drizzly outside, you can often get a more effective and efficient workout when you choose indoor spinning for your triathlon training. Most spin and indoor cycle bikes come equipped with all the high tech equipment to monitor your heart rate, cadence, power output, RPMs, and more. No more guessing how hard you’re working or how much improvement you are making over your last cycle training session. Did you know that indoor bike training is also great cross training for a marathon. A well rounded athlete can use cross training to strengthen all of the supporting structures involved in their sport, not just the primarily impacted joints, ligaments, and muscle groups. California Family Fitness has locations all over the Sacramento Valley to satisfy your fix for some serious indoor triathlon cycle training. 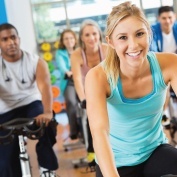 Classes vary from beginner to advanced, so there’s a spin training class for everyone. The coaches and instructors are all highly qualified and certified, and know how to bring some serious fun to training for a big triathlon or marathon event. And since triathlon training is a total body competition, you’re going to want the most comprehensive total body training to compliment your cycling efforts. X-Bike classes at CalFit are specially formulated cycle classes that come in a variety of intensity levels to fit your individual training phase at any given time. The bikes are designed to give you a full body workout that burns up to twice as many calories in a single class as traditional group spin classes. Looking to lean out quick for your race? X-Bike classes are your answer! If you really want to get competitive, you can even check out the CalFitactive run, marathon, triathlon, obstacle, and swim training program. This is for the athlete who wants to take it to the next level, getting expert coaching and motivation to train harder and smarter for the next triathlon. Don’t let winter weather dampen your spirit for adventure, and certainly don’t let it slow down your training progress. Check out indoor cycling or the CalFitactive training program and get an edge on the competition!